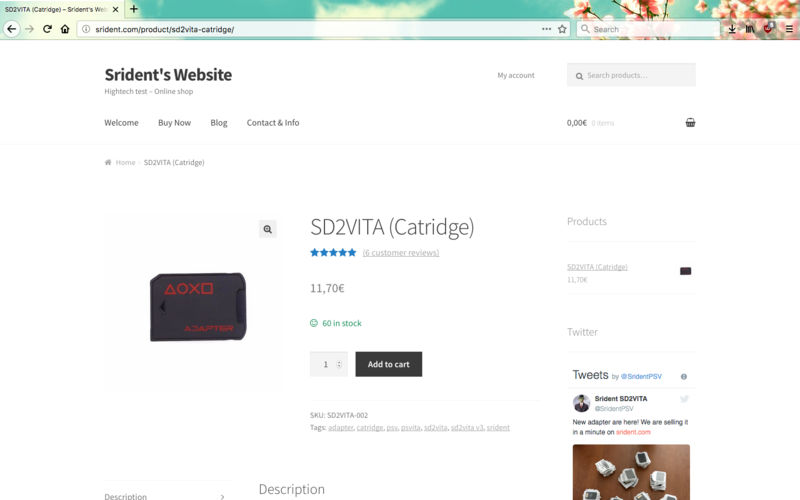 Review: Srident reselling SD2Vita 3.0 adapters – Finally looks like a Vita cartridge! Update: It’s been brought to my attention that these SD2Vita adapters are exactly like the ones you find on eBay and Srident is just a reseller. Sorry for any inconvenience caused. Sections 2 & 3 are mostly valid for SD2Vita 3.0 adapters sold by others found on eBay. When in last July the first adapters were being shipped out, there was one question on many people’s mind: “When will we get an adapter that’s in a nice case?”. Well, now, after a couple of months, an evolution of the SD2Vita adapter has occurred and Srident has decided to produce some adapters for us all! Note from Aurora: This review will not be following the format of my previous 2 SD2Vita adapter reviews but will employ an updated format with a small summary to read at the end of every section. La Poste does a pretty good job! it’s stuck in customs for). Packaging and Package contents: My adapter came in a somewhat large (A5) padded envelope and in my opinion, it had ample protection while being shipped. The adapter also comes in a small plastic case which can be used to store it safely if you’re not using it for whatever reason. My only gripe is that you don’t get a piece of paper that provides a brief explanation on how to install and use the adapter along with some links where you could contact Srident if you have any issues. Quite understandably, the most important thing in this adapter over the v1 (PCB) adapters is the design. In this section, a brief account of some visual aspects will be given. Material and build quality: The material is some type of hard plastic that feels pretty sturdy in the hands. As for the how the plastic is cut, a good job was done as the edges aren’t rough and a nice aesthetic is given off by the cuttings on the back. This adapter has a spring that lets you know you properly inserted it in the game card slot so no more playing around with the adapter for it to fit in. 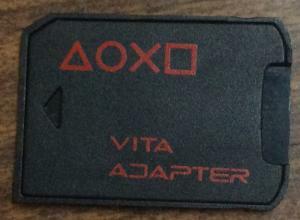 Outwardly appearance: On the front, there are the words “Vita Adapter” in red along with a small graphic of the triangle, circle, cross and square that represent the PSVita’s face buttons. There is an arrow on the front of the adapter which lets you know which way you should insert the adapter in, which is a pretty nice touch in my opinion. 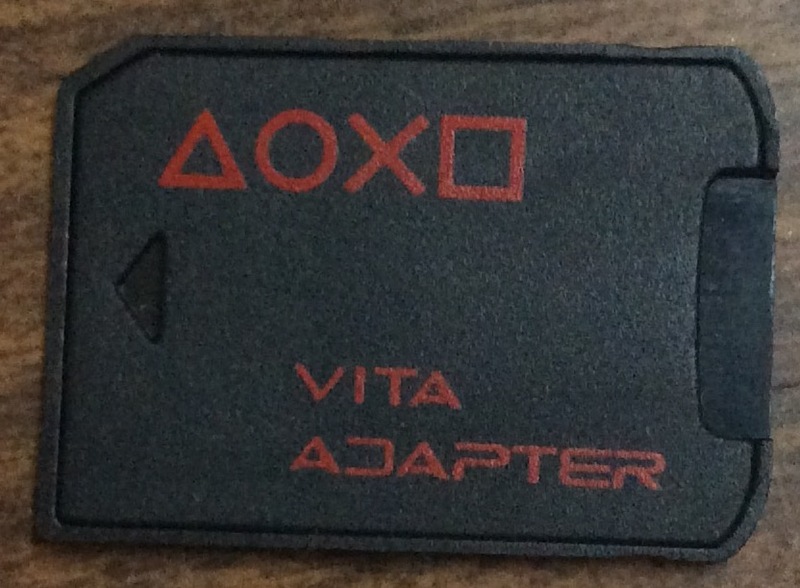 Just in case you hadn’t noticed, the adapter looks like an original PSVita game cartridge. Originality: This adapter looks *exactly* like SD2Vita 3.0 adapters sold on other marketplaces such as eBay which is something that annoys me a little bit. In my opinion, the adapter should’ve had “Srident” written on it somewhere and maybe an image of the HENkaku Enso logo on the back to give it a more authentic feeling so that it screams “created by and for the community”. My suggestions (or any other visible design changes) would differentiate the adapter from the adapters one can find from China and make it more unique. A word on opening the adapter: I advise against opening the adapter since it may not hold together very well after closing it (it’s composed of 2 separate pieces of plastic) and the gold connectors on the back may not be properly aligned with the Vita’s game card slot. Section performance: Grade B / The design is quite nice and appealing but I personally think that Srident should’ve given it a unique touch. One of the most important important aspects when buying a product is how well it works. This section is here to describe just that. First and foremost, this adapter uses a modified SD2Vita board design that’s based on ‘xyzz”s original design. Srident is not the person behind the new board design so any problems and questions regarding the actual PCB itself should not be directly directed to him. In order for the PCB to fit in the plastic Vita cartridge-esque case, it’s pretty thin but there should be no issue with that since you won’t be opening your adapter up. The adapter still works at 5MB/s which, according to Srident, is a limitation of the game card slot’s hardware. This is fast enough for all operations on the PSVita and it’s the same speed as when using the Vita memory card when it comes to loading times. SD2Vita adapters slot in the Vita’s game card slot. This means that they can be used on Vita 1000 Wi-Fi, Vita 1000 Wi-Fi+3G and Vita 2000 models as long as they’re on firmware version 3.60. They also probably work with PSTVs but external USB storage is, in most cases, a better medium for them. They can be mounted as ux0 or uma0 by using different plugins. 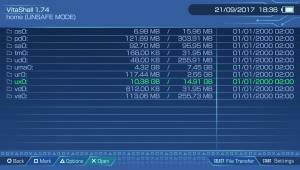 The write speed is about 5MB/s when copying a 200MB file from the Vita’s memory card which is pretty decent considering the Vita doesn’t need blazing fast speeds to function well. SD2Vita 3.0 adapters have a nice case that lets you easily take them out and put them back in if you wish to use official Vita game cartridges. Do keep in mind that you can’t hot-swap SD2Vita adapters with other SD2Vita adapters or normal game carts. microSD cards up to 200GB are reported to work without any issues. 256GB are said not to work that well by some so you should stick to 200GB cards as a maximum. 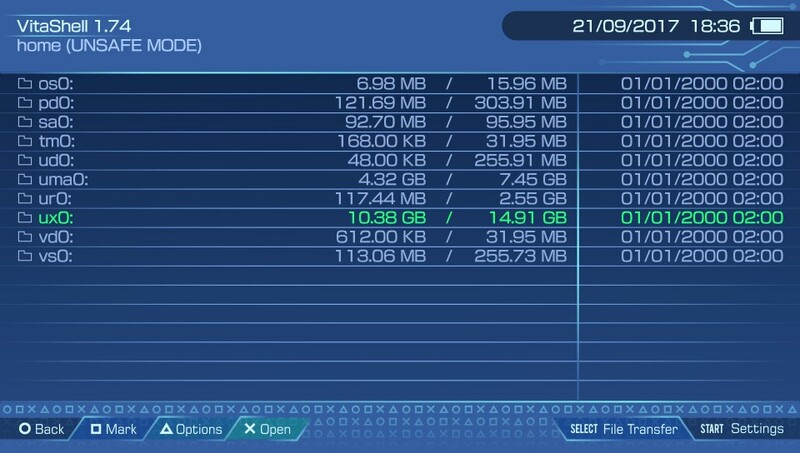 You shouldn’t need more than 200GB for your Vita anyway. Section performance: Grade A / The adapter works exactly as you would expect and that is very well. I have been using the adapter daily for 5 days and I had 0 issues with it whatsoever. Compared to v1 adapters, SD2Vita 3.0 ones rarely, if ever, don’t function because they’re not put in correctly since it’s hard to mess up! Website: Srident’s website is pretty simple and straightforward. It has a clean design which lets you access what you want without any extra clutter. The website can probably be set up for more products so Srident could easily sell different colours/designs of the adapter on the same website. You may also read some short reviews of the adapter from approved buyers if you wish. My main gripe about the website is that it doesn’t have a proper page that tells you how to set the adapter up while providing some more information about it. The ‘blog’ section does have a link on how to set it up but the linked website is in Japanese which means it’s useless to a pretty large share of his buyers. Payment method: The adapter isn’t on eBay/Amazon so you must buy it through Srident’s market place website. That being said, it’s still pretty easy to do it and the payment processor used is PayPal which means you could easily request buyer protection. That being said, I doubt you will need PayPal to step in after reading the next section: After-sales service. Section performance: Grade B+ / The website is pretty decent but it’s quite lacking when it comes to how much information is given on the adapter and how to set it up. That being said, this article can be used as reference as to what the adapter itself actually is. The payment method is one of the most, if not the most, secure payment methods and one you should have no issues with. How complains/issues are handled: If you have any problems, you can contact Srident on Twitter or via e-mail. In my opinion, the best way to contact him is through Twitter since he responds within a few hours (or immediately if he’s on) and you could find a solution in one session rather than with a lot of messages floating around (like on eBay). He’s been quite quick to respond to any of my questions and we discussed how he handles customers’ issues; I reached a conclusion that he is to be trusted and will work with you towards a solution if your claim makes sense. Warranty and DOA devices: Srident tests a decent amount of his adapters when they arrive but you may still receive a damaged one since things can always find a way to wrong. If that happens, Srident will be happy to send you a replacement if you show him video proof of the issue. When it comes to warranty, the adapter should be covered for a reasonable amount of time so if it breaks after a few weeks or possibly months (which it shouldn’t), Srident will send you a replacement if they’re still in stock. Pricing: The adapter costs €11.70 and the shipping costs €1.20. This means that it will cost a total of €12.90 which, in my opinion, is a good price considering the great product and after-sales service you’ll be getting. All prices are in Euro. Section performance: Grade A+ / Srident has had many satisfied customers and he’s always been quick to step in if legitimate issues arise! The final grade that I give the adapter is Grade A- and that is because it has some little shortcomings in places. I am personally satisfied with it and will be using it for years to come unless it breaks! To get one of his great adapters for yourself, visit the link below! Should you buy it if you already have a v1 adapter? : Unless you wish to use your official Vita game cartridges, I personally don’t see a reason why. That being said, it’s a good adapter to buy if you don’t have a v1 adapter because you didn’t have a use for it back then (for example if you have a large Vita memory card). From a different perspective,the Christmas season is coming so it’s a good way to buy some cheap storage for a PSVita you may wish to give as a present! If you wish to only read a quick summary, just read the section summaries together and the conclusion! Disclaimer from Aurora: Neither I nor Wololo are responsible for any purchase decisions you do. If you have any issues with your purchase, refer them to Srident. The article tries to be as objective and unbiased as possible but my opinion is still present. Wololo does not benefit from the sale of these adapters. The adapter I got is a free review copy. Sections 2 & 3 are mostly valid for SD2Vita 3.0 adapters sold by others found on eBay. Honestly don’t care where mine is manufactured, so long as it can hold up. These hold up. The point is there is no point in buying this over the source where he buys these. He’s just inflating the price to get a commission for doing nothing. Nothing wrong with that, but no reason to buy into it, either. True. I’ve updated to article accordingly. Some seller on eBay has apparently opened these adapters up to check out the insides. Dunno if you want to borrow his pics or not, but it’s kinda cool for us curious folk. Nope, default theme is black. Why isn’t this article deleted? Are you getting a cut? Those adapters have been available on ebay for more than 2 months. So first of all, the guy you are advertising for didn’t create them, and this isn’t news. Oh, and what’s worse, your reseller is more expensive than the Chinese sellers on ebay (where he got his supply). hackinformer sells sd2vita plus i am more confident in their quality and happy to support them too. looking at ur nickname… u must be very intelligent. Strident does not send another for a damaged unit and doesn’t bother to answer e-mails. Would you mind showing proof of what happened? He told me some people tried scamming him for a replacement. Sure, can you point out your profile page in the forums so I can PM you? Thank you for the article, Aurora. All being said, would there be any point (other than supporting him, obviously) in buying it if I have already bought another sd2vita version 3.0 adpter ? another somewhat misguided article. not to mention you clearly were unaware Srident is just reselling Chinese products. could’ve at least mentioned these DO NOT fit in slim models. the flap won’t close. Any proof that they don’t fit? This is the first time I heard they don’t fit in Vita Slim models and it strikes me as odd since they seem to be the same dimensions as a normal Vita cartridge. 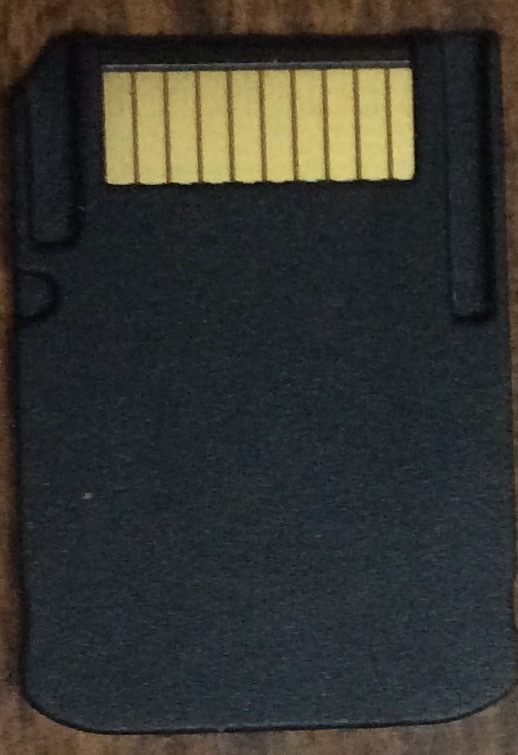 The Slim flap has a plastic bit on each side that sits next to the “curvature" at the top of retail cartridges. Even though they’re the same size, these adapters are more square-ish, leaving no room for those 2 bits, so the flap can’t close properly. The flap in fat models doesn’t have those, so it doesn’t affect them. My phone’s broken but there’s a thread on gbatemp with pictures. this is true, support 256GB? 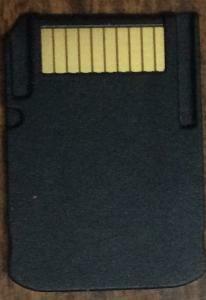 The Slim flap has a plastic bit on each side that sits next to the “curvature” at the top of retail cartridges. Even though they’re the same size, these adapters are more square-ish, leaving no room for those 2 bits, so the flap can’t close properly. The flap in fat models doesn’t have those, so it doesn’t affect them. I wouldn’t feel comfortable using his website since he doesn’t have any kind of https support either using SSL/TLS. It’s not a safe or secure site. i got mine for 700php which is 15$ in u.s.. but it really holds out. no problems so far. I have a V1 Srident and had a lot of issues with. Sometimes I booted up the vita and it was loading for 5 min and finally the Livearea was empty and the adapter wasn’t properly detected, sometimes it worked…. very random connectors. Then I’ve bought one of those V3 on eBay a few weeks ago for a few Euros, and it works perfectly, no more issues. I used Srident’s v1 adapter since I received it in July until I stopped using it last week because I received this v3 one. I had 0 issues with the v1 adapter. I have bought, paid for, and been charged for TWO of these and haven’t received either of them. Have never gotten a confirmation email. I’ve emailed about it, to find out what the deal was, never got a response. I ended up going through E-Bay’s and PayPal’s, “request a refund,” options. I used Ebay’s, “Resolve a problem,” option. Semantics, but yeah. this is not his fault as Srident doesn’t sell his on ebay. I could use a christmas present like a vita adapter and I would order a blue case to go with my vita color if ever someone makes one. Imo not having a setup guide is upsetting to somw but it could be added at any time later anyways. I’ll be buying a PSTV soon and I can only buy stuff from Aliexpress and they actually offer an SD2VITA 3.0, how do I distinguish between knockoffs and originals??? It’s open-sourced, so there is no difference. By chance, does anyone know how to ship these to Argentina? I’ve contacted him twice and no reply, so buy at your own risk. It´s the RED version you got problems with? Yes it was the red version. The Chinese used hot glue to hold together the casing. It damaged lots of boards. They “fixed” it (as in, not using hot glue) in the red version.